I just read an article that said: "Social apartheid" warning as 1.5 MILLION more kids grow up in poverty than 40 years ago. This is happening, but God has the ability to balance the scales. There is ruin that is happening all across America, most people are blind to it or ignorant of it. So many people in this country think that the U.S. is still Prosperous and Free and they feel a sense of entitlement,. The truth is it now stands divided...maybe the division never truly went away all this light is shining on it directly in the midst of all this controversy. My Heart is very heavy now, not only for Trayvon's life, but for the Youth of this country. 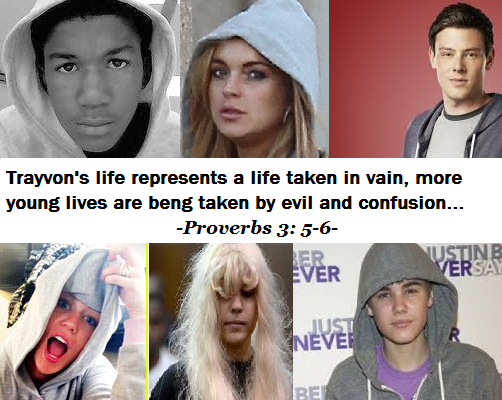 Trayvon represents a life that was taken in vain and so many more are taken in vain because of confusion in the mind. All these Disney Kids: Amanda, Miley, Lindsey turned to drugs for their "high", under the realization that fame and fortune just Isn't enough. Corey, a star in the show Glee just died He was reported to be on drugs as well. The very youth that are supposed to represent the joy of life, success, and vitality are falling short because as a nation we are not on one accord. However, all will be well... There is a consistent word from the Lord that an Army is rising up It is the truth There Is An Army Rising Up. People that love God, that serve Him, that are willing to speak out and go the distance. I serve as a voice to say this: Let us as a nation get out of our own way, let us realize that we are not entitled to anything except the blessing and purpose of the Lord. If whatever you're waiting on and working for does not fall within those lines, drop it and start a new. God is a God of forgiveness, joy, healing, and restoration. Either you're a believer or you're not. I will walk with the right army. God is real, His ways and His words will stand over all of time. All this talk about Justice let us please make sure we get on the right side!! God's people its time for us to rise up truly and come into who we are. Justice and peace must first be found in the righteousness of our spirit through faith in God, and then we can properly dispense it into the world. Justice and peace has to first be found in the righteousness of your spirit through faith in God and then it an be poured into the world.